Dull-brown, gray or nearly black caterpillars that are 1 ½" - 2" long. Some cutworms are spotted, others are striped. Usually they hide in the soil during the day and feed at night. They are the larvae of night-flying brown or grayish moths. Cutworms occasionally infest lawns. They feed on the leaves or cut off the grass near the soil and may do severe damage to seedlings of Bermudagrass, Bentgrass and Ryegrass. 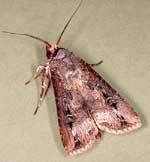 The large, hairless cutworm feeds on the surface and can destroy patches of turf. Cutworms feed at night and damage the turf by snipping plants off at ground level. Large numbers of birds feeding extensively in a turf area may indicate a high population of cutworms. Cutworms often appear in early spring when temperatures move above freezing. Turfgrass damage appears as closely clipped grass blades in patterns radiating from the cutworm's tunnel or hiding place. Threshold: 10 per sq. ft.
Cutworms leave small, 1" - 2" wide patches of brown grass in newly seeded and established lawns with the plants eaten off at soil level. Cutworms don't seriously damage grass unless there is a severe infestation of cutworms. More damage is sometimes noticed by birds scratching at the turf to feed on the larvae.